Featuring within it's ranks two members of Blind Guardian, Marcus Siepen (guitars) and Frederik Ehmke (drums), and having originally gone by the name of Neoshine (with an EP, "With a Neoshine", surfacing in 2005 and a demo, "III", appearing in 2007) Germany's Sinbreed are now on album number two with the exceptional "Shadows". With the band's guitarist/keyboardist Flo Laurin sitting in the producer's chair and producer Markus Teske (Symphony X, Vanden Plas, Neal Morse, Saga and many more) once more taking care of the mixing and mastering aspects of "Shadows" just like he did on the group's (well-received) 2010 debut-album, "When Worlds Collide", "Shadows" ends up as an early 2014 favorite in the field of European-styled melodic power metal/speed metal! With a line-up that also includes former Neoshine member Alexander Schulz on bass and the (spotlight-stealing) Herbie Langhans (Beyond the Bridge, ex-Seventh Avenue, ex-The Preachers, ex-Neoshine) on vocals Sinbreed, in an effort to put some real space between themselves and the rest of melodic power metal/speed metal scene, marches their way through album number two with cuts such as (opener) "Bleed" ("Shadows" first single), the sweeping "Call To Arms" and "Leaving The Road" staking a claim early on that this one will be epic! Pardon the pun, but closer "Standing Tall" stands tall with it's power metal take on Iron Maiden and even as the band speeds things up on the likes of "Far Too Long" and "London Moon" they never lose focus on task at hand, creating melodic metal masterpieces! 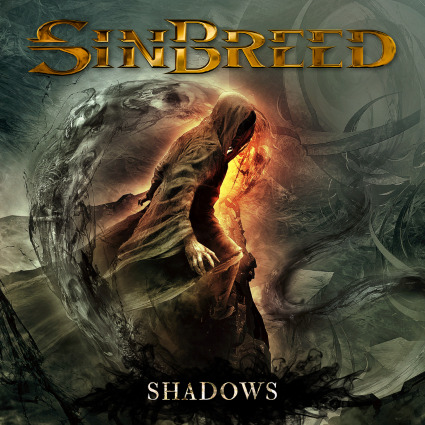 Sinbreed's ability to write catchy numbers along the likes of "Call To Arms", "Bleed" and "Far Too Long" is head's above the competition and given the stylistic differences offered on numbers like the majestic "Reborn" and the aggressive "Black Death" ( a monster of a cut, "Black Death" is by far the heaviest and most "extreme" number on this disc and it just BOOKS it's way right down the middle of the road!) it's hard not to be pleased by this band's obvious quest towards balance and perfection. Sinbreed has all it takes to be the voice of a new generation of melodic power metal/speed metal bands. That's of course if their voice can end up being heard more frequently then it has been. After all four years between albums is a real long stretch! Based on what's going on with "Shadows" might it just be that the time has come for all involved to push this act to the forefront? One could make that argument and I most certainly would!